Against the backdrop of debates over deforestation, environmental degradation and climate change in Khyber Pakhtunkhwa (KPK), Pakistan’s Tehreek-e-Insaaf (PTI), the province’s ruling party, started the Green Growth Initiative (GCI) in 2014. A “Green Growth Vision” was unveiled by the party, which laid out a strategy for the “greening” of growth in Pakistan. Six sectors were the focus of intervention: forestry, protected areas/national parks, clean energy, climate resilience, water/sanitation, and waste management. Different projects were announced for each of these sectors. These projects include the Billion Tree Tsunami Project (BTTAP), the KPK National Parks project, and the Community Micro-Hydel project. This article focuses on the Billion Tree Tsunami project, a project that proposes to plant 1 billion trees in the province. I draw from fieldwork I conducted in the KPK district of Mansehra, where the BTTAP was heavily implemented. Under this project, the provincial government has targeted the forest area in KPK for a major enhancement of between 20 to 22 per cent by 2018. This amounts to an additional 30,000 hectares of forestland, at the very least. Additionally, through enrichment measures, the tree cover of existing forests would be increased from anywhere between 20 to 30 per cent by 2018. 550 million tree saplings will be planted in two phases and the remaining 450 million saplings are being naturally generated in forest enclosures. Plant species to be planted include oleander, Aeasia Arabia, chir pine, walnut, ziziphus, Palosa, Shisham, eucalyptus. The project has two major components. 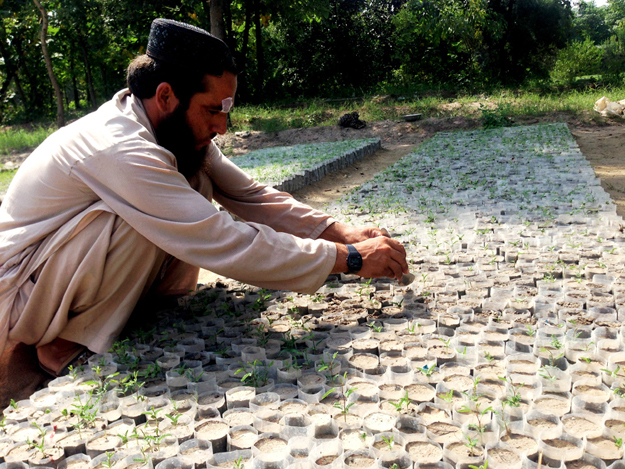 Under this program, 550 million tree saplings will be planted over 250,000 hectares. This plantation will be done on government fallow land, communal land and private land. In the case of communal land, Village Development Committees (VDCs) are determining which land is selected for plantation. In the case of private land, owners can directly contract with the forest department. The Chief Conservator Forest (CCF) KPK told one newspaper: “we are utilizing private land because we have a paucity of state owned land for execution of the project and, in order to convince people, we have to offer them benefits”. These plantations are done by the forestry department in collaboration with private entrepreneurs. Private landowners receive hefty sums for these contracts, in addition to having rights to sell these plants in the market after a stipulated number of years. The other major component of the BTTAP project is natural regeneration. For this purpose, around 450 million trees will be generated in enclosures: patches of forest where no other activity is allowed. These enclosures are in reserve forests, which are state owned forests. Around 3500 enclosures have been established throughout the province, with the total area under enclosure being 37,5000 hectares. These enclosures are closed for three consecutive years for grazing and other activities. Even the right to passage, collect timber and cut grass is being withdrawn. According to the project’s website, the BTTAP’s objectives are the “enhancement of forest resource base, rehabilitation and improvement of existing forest ecosystems of the province and arresting environmental degradation, livelihood improvement and job creation for rural youth at their door-step”. Conservation projects like BTTAP though often ignore the social and political context into which these projects are inserted. However, as critics have pointed out, it’s being increasingly realized that “action to conserve biodiversity, particularly through the creation of protected areas (PAs), is inherently political”. If we simply look at the aims and objectives of the project as stated on its website, it appears that the project is apolitical. But a deeper look into the narrative of project officials shows that they themselves are aware of its political nature. For example, Malik Amin Aslam, Chairman of the Green Growth Initiative and global vice president of the International Union of Conservation of Nature (IUCN), wrote in a policy brief that BTTAP is a “unique political experiment”. Going further, a political ecology perspective on conservation informs us that the costs and benefits associated with environmental change are not equally distributed. Rather, certain sections of society benefit from environmental change while other sections may be further marginalized. This feature of environmental change has wider implications for inequality in society. Any environmental intervention that is not fully informed of local realities (of class, caste, ethnicity, power, and land tenure) often exacerbates existing inequalities, in a process I call marginalization by conservation. The BTTAP project is envisaged as a public-private partnership. According to Malik Asim, chairman of the project, the project is an “outsourced and private sector driven model of forest growth, as well as a community driven forest protection”. The BTTAP presents itself as a project involving the cooperation of the state, local communities and the private sector. State authorities have envisioned the plan, making regulatory and policy interventions for the execution of the project. In addition, state authorities are involved in subsidizing plant nurseries, capacity building, and social mobilization of the community. Policy and regulatory interventions include a complete ban on tree felling, dismantling sawmills, enclosing forest areas to stop livestock grazing and land evictions. The project has a very strong emphasis on including the community in protecting and nurturing the forests. The community has been incorporated in two ways. First, Village Development Committees (VDCs) and Joint Forest Management Committees (JFMCs) have been established. Both committees play a very crucial role as an interface between state authorities and local communities. Some of the important duties assigned to these committees include the identification of which land will be forested, the distribution of cheques and the appointment of forest nighabans. Appointed for a 3-year term, the forest nighaban is someone from the community living near the forest, whose responsibility it is to attend to the day-to-day management of the forest. On the face of it, VDCs and the appointment of locals as nighaban appears to ensure community participation. However, the state authorities have deliberately looked over local politics in this whole process. For example, many of these VDCs are powerful landowners of the area. There is little to no representation of landless or tenant classes in these committees. Ultimately, the committees who decide which areas to enclose consist of members not directly affected by the enclosures. Furthermore, the final selection of the nighabans is done by these same committees. They give preference to their relatives. In many areas, the composition of VDCs and the nighaban point to this. For instance, during my fieldwork in the area of Agror-tanawal in Mansehra district, I was informed that all members of the VCD were from the same ethnic group. All of them were Swatis and related to one another. The VDC also appointed three nighabans who were Swati and related to members of the VDC. Although there are many Gujjar families in the area, they have absolutely no representation on the committee. One incident illustrates the extent to which power and class politics lies behind the façade of “community participation”. Younus (name changed) lives in the area of Agror-tanawal. He has a small patch of land that he was using to graze his small herd. From all four sides, his land is surrounded by the land of three brothers. These three brothers are members of the above mentioned VDC. The brothers got a contract with the forest department to plant forests on their land. But Yunus is no longer able to access his own grazing land because of the surrounding plantation, which is protected for the next five years. We need to understand that conservation and other environmental projects are inherently political. The costs and benefits of environmental protections are unequally distributed. And political and class power plays an important role in the distribution of these costs and benefits. The enclosures for plant regeneration are having devastating effects on land tenure relations. Land distribution in the Mansehra district of KPK is already skewed along ethnic lines. The major ethnic groups in the area are Swati (consisting of various Pashtun tribes), Syeds and Gujjars. The mountainous geography and limited availability of water in the area only allows small-scale subsistence agriculture. These factors also limit crop-yields, such that there is often little surplus to sell to the market. Costs to transport crops to the market are also high. The result is that agriculture, at least by the local elite, is not seen as lucrative. Swatis are the biggest group of landowners. Many of these Swatis are absentee landlords who have rented out land to Gujjars. Many of these landowner Swatis have moved to the nearby cities of Mansehra or Abbotabad. There, they work in the services sector or are self-employed as shopkeepers and construction contractors. Their connection with the land is limited to collecting rent, which is nominal because of the low productivity of land. There are two main rent arrangements in the area. First, in areas where land is suitable for agricultural purposes, the land tenure is sharecropping. Rent varies and is paid in kind. Second, in areas where land is used for pasture, the rent is fixed and paid in cash. Gujjars are mainly landless herders. They rent-in land from Swatis or other landowners. They raise animals, mostly goats, and sell them to the market. These goats are consumed in major Punjabi cities and in the army. Sometimes these goats are also smuggled into Afghanistan. During the winter, when there is a shortage of grass and fodder, these Gujjars rent private land for grazing. In the summer, they move their herds to common pastures in the Kaghan Valley. And at start of winter in September, they move back to Jabori, with some going even further down to Haripur. For the Gujjars, access to land is seen as central to their survival. If they don’t have access to land, they will be unable to graze their animals and support themselves. The announcement of the BTTAP project brought with it a change in how land was used in the area. For instance, now landowners could contract with the forest department to plant trees on their land in return for an assurance that these plants will be protected for five years. After five years, landowners have de-facto rights to cut and sell these plants in the market. Also, landowners are given the discretion to choose which species of tree is planted. In most cases, they choose Euclyptus because of its fast growth. According to many of the landowners I spoke with, Euclyptus will generate more surplus than rent from tenants. Many of the landowners have therefore decided to take their land back from the tenants and enter into contracts with the forest department. Many of the Gujjars have lost access to the private land on which they used to graze their animals in the winter. Some of those Gujjars have even had to sell all their herds and move to the city to find work. Some have also started working as labourers in the local market. I met one such person in Jabori, a small town in Mansehra district. I was standing in the town center waiting for my host to arrive. One guy, who must’ve been around 22 or 23, approached me and asked if I could give him some money. To explain why he’d resorted to begging, he said he’d been trying to find work, without success, for the last 3 days. Now he no longer had any money for lunch. I agreed to buy him lunch on the condition that he tells me his whole story. Amir (name changed) used to herd his father’s goats. The herd size was around 150 goats. In 2015, their landowner contracted with forest department for plantation. Amir and his father were told they could no longer graze their goats on this land. They tried to get land from other people but land was becoming scarce as more and more landowners were contracting with the forest department. They tried to buy fodder from the market but it was too expensive. Before the project, one option for grazing was to use state-owned reserve forest. But all rights of grazing, passage or living in state owned forest have been withdrawn. Because of local corruption, however, one could bribe local forest officials to get permission to cut grass. However, this would not be enough grass to raise a herd of 150 goats. Amir’s family therefore started selling goats to get money to buy fodder for other goats. That is how they tried to make both ends meet. But eventually his father gave up the idea to keep those animals and sold the entire herd. Amir stayed with his parents and started working as a labourer. One brother moved to the city of Mansehra where he works at his uncle’s shop. The father is now at home taking care of the one animal left after this period of crisis: a cow. But this is not the story of just one family. As the BTTAP project unfolds and Swati landowners increasingly contract with the forest department, many Gujjar families are losing access to land and becoming proletarianized. Conservation appears to be promoting further marginalization. Usman Ashraf is a political ecologist. He recently graduated in agrarian, food and environmental studies from the International Institute of Social Studies, The Hague.